The OWA laureate Lal Emmanuel has a degree in agricultural science and worked already in the seventies as a teacher on sustainable agriculture. In his various positions and engagements he always had a focus on working with the youth. 10 years ago he set up the Nagenahiru Foundation. Mr. Emmanuel is an environmentalist at heart and all his activities are somehow based on or connected with nature conservation– especially the mangroves and lakes. 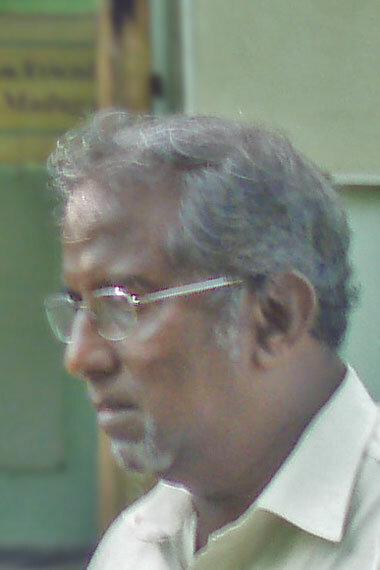 He is a member of the organic farming network in Sri Lanka and well integrated in the organic movement. Internationally he is very active in the global “Living Lake Network”. Mr. Emmanuel gave up a secure life as a civil servant to follow his passion for nature. He is driven by his mission to work foremost for the benefit of disadvantaged people and the young generation. His knowledge on many issues and topics is outstanding and he works with a holistic approach combining the care for nature with the needs of the people. His extraordinary dedication qualifies him very well as laureate of the OWA prize and with his impressive energy he will – now also due to his increased international fame as OWA laureate – inspire people all around the world. The foundation was set up in 1991 as an independent, non-governmental and non-profit organization. The activities are centred around the lakes of Maduganga and Madampe, which have a surface area of about 1.200 hectares and are located some 70 kilometres south of the capital city Colombo. About 45.000 people live around the two lakes, getting their main income from fishery, agriculture and handicraft. Nagenahiru employs 11 full time staff and can count on the support of 36 volunteers. Over 700 families benefit directly from the work of the foundation, which gets financial support among others from EU funds, GTZ, OXFAM and Helvetas. The project activities are very diversified and different, but all contribute in an outstanding way to the objective of the One World Award, namely to sustainability. A look at the activities of Mr. Emmanuel and the foundation has to start with the mangroves, which are threatened by mankind all around the world. The tsunami catastrophe in 2004 affected the people in the region greatly and they had to find out the hard way that destroying the habitat of mangroves can have terrible consequences. Their understanding and appreciation of the protective capacity of mangroves in disasters like tsunami waves has certainly helped the mangrove restoration project of the foundation. This has established 10 villages nurseries so far, which grow and have already planted more than 30.000 trees. Eleven different mangrove species have been selected for the programme and up to now 15 hectares of mangroves have been replanted. 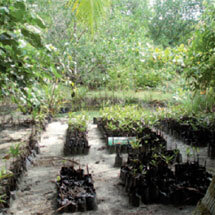 Important in the context of this work is also the involvement in raising environmental awareness of mangroves, which the foundation is accomplishing on the one side through publications and on a practical level through the setting up of two demonstration and teaching centres on mangroves and connected environmental and social issues. To make sure that the lakes can continue to “live” the foundation has also focused on safeguarding clean water. Simple but efficient systems of cleaning waste water (so-called green filters) were installed and there is an ongoing campaign to reduce the pollution of the lake caused by gasoline from boats. With the help of the foundation’s partner organization Global Nature Fund in Germany and GTZ funding the foundation has implemented a very innovative and interesting project by the introduction of the use of solar light for night fishing and shrimp catching. The pilot study has proven that solar lamps provide a highly significant contribution to reduce environmental pollution caused by the use of kerosene by the fishermen. The fuel for the lamps frequently spills into the water and thus disturbs the lake’s ecology – especially the breeding grounds of fish. Kerosene is a large source of greenhouse-gas emission in the country! The fumes affect the health of the fishermen and the continually increasing high prices affect the economic viability of the shrimp catching and fishing. The fishermen have to invest well over 20% of the total income just to buy kerosene. 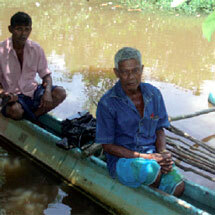 In a first phase 53 fishermen are already enjoying the benefits of solar light. The plan is now not only to provide all fishermen around the two lakes with solar and LED lamps but also to use the experience from this project in the fishing community at Lake Victoria in Africa. The foundation also very actively promotes organic farming through workshops and is helping to set up commercial vegetable farms. Trained by the IFOAM member organization “Gami Seva Sevana” commercial vegetable farmers and 15 families have been trained and helped to start organic farming and home gardening . Emmanuel and the foundation do not only contribute to the ecological pillar of sustainability but also to the social and economic objectives. Alleviating poverty and providing economically viable livelihoods is at the heart of the foundation’s work. 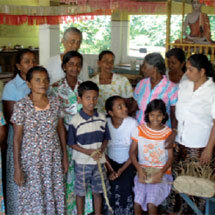 Apart from the organic programme the foundation has started 2 income generating projects. Together with the women’s organization RANTARU (“Golden Star”) the foundation is providing training and marketing support for handicraft made of reeds, which are cultivated in the wetlands by local families. 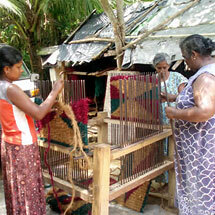 Another project produces coconut fibre cords which, dyed and woven into doormats, find a good market in Sri Lanka. Many families are already engaged in these economic activities and some families could even start to employ further workers.